I recently read a news article about Frank Woodruff Buckles, billed as "America's Last Survivor of the First World War". Reading that article got me to thinking about WWI (1914-1918) and the toll it took on the world. It lasted for four years and involved most of the world’s great powers. At 109 years old, Frank Buckles is taking up the cause for a National World War I Memorial on the Mall in Washington, D.C. Buckles said, “I know that I am a representative of all those who have gone before me. Those veterans, especially those who made the supreme sacrifice, should be remembered.” That is a fact that is hard to dispute, but opponents to Buckles' idea say that there is already a WWI memorial in Washington and they are right. The District of Columbia’s War Memorial stands in West Potomac Park and commemorates the 26,000 residents of Washington, D.C. who served in World War I. This is a fine memorial but Frank Buckles and several members of Congress think that the millions of other Americans that served in World War I should not be overlooked. 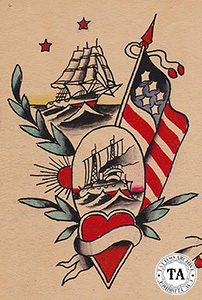 Professional tattooing was well established in the United States by the start of the 20th century and had become a popular art form for sailors around the world. A.T. Sinclair, writing for American Anthropologist in 1908 stated that a full ninety percent of American sailors were tattooed. Although this seems a bit high it gives you an idea of the popularity of tattooing in the Navy. In 1909 a flyer from the United States Navy stated that indecent or obscene tattooing was a cause for rejection, but applicants should be given a chance to alter the design so they could enter the Navy. 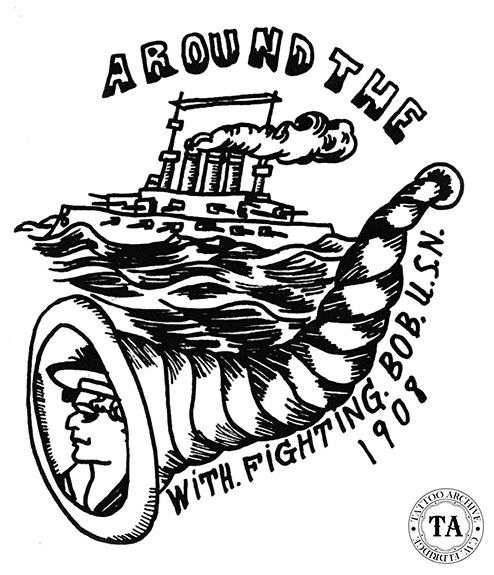 It is unknown if the Navy relaxed this policy after the start of World War I. Many of the tattoo designs from WWI were leftover from the Spanish American War (1898). Those patriotic, sentimental, religious, heroic, nautical and friendship designs seem universal no matter what war we are fighting. Often all it takes it a subtle change to update an image and make it look more modern: like hairstyles on pin-ups, hats on sailors or the type of ship shown on a chest piece.